4 signed. Let's get to 100! This weekend we learned there would be no hero swooping in to save us from Donald Trump and his corruption. It’s up to us to save the day. To take back our country and clean up the corruption that threatens our democracy. To stop the Trump agenda and the GOP obstructionists like Mitch McConnell. It is infuriating that Trump believes the Mueller report exonerated him when in fact it did the opposite. It is infuriating that the right wing media propaganda machine is helping the White House spin that narrative. But let’s channel our anger where it belongs -- on Trump. And the GOP. It’s up to us to save ourselves from the lies, the abject corruption and heinous agenda of Donald Trump, his administration and the GOP, which is complicit in his corruption and cheerleaders for his agenda. We will continue to fight for the release of the full and unvarnished Russia Investigation report, but we don’t need a damn report to know that Donald J. Trump is corrupt. And so are his GOP obstructionist cronies on Capitol Hill, where Mitch McConnell is so eager to protect the swamp, that he refuses to allow a vote on H.R. 1 For the People Act, the most sweeping package of anti-corruption measures since Watergate. We don’t need a report to know that Trump is a dangerously bad president that has not lived up to his own hype, has broken every campaign promise he ever made, including that he would lower taxes, cut prescription drug prices, protect people with preexisting conditions, build a wall paid for by Mexico and not make cuts to Medicare, Medicaid and Social Security. We don’t need a report to tell us that Trump lied to veterans -- promising to fix the Veterans Administration. We don’t need a report to tell us that Trump’s trade wars and tariffs are harming American farmers. What we need is you. All of you - using the power of your voice and your vote and your activism to take the fight directly to Trump and the Republicans on a daily basis. Keep the pressure on them. Expose their lies, corruption, greed and obstruction. We’ve got this. We the people. Heroes. Are you in? Sign up and get daily calls to action. 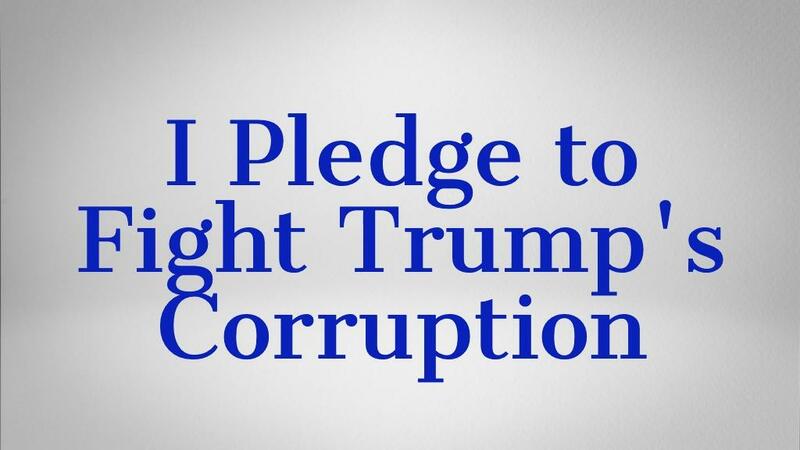 Sign the petition and pledge to fight Trump’s corruption. And that of the corrupt GOP.